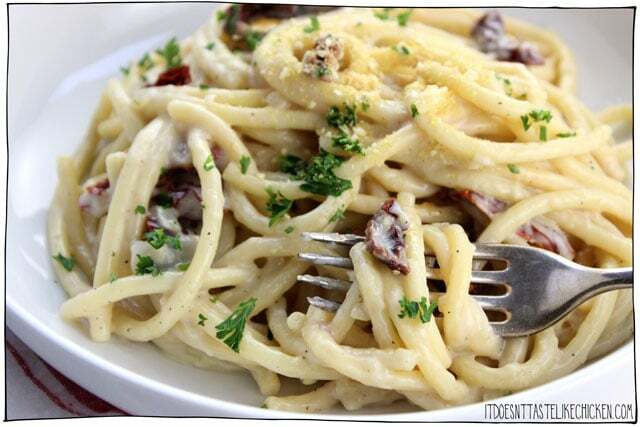 A traditional carbonara is made with eggs, bacon or pancetta, and cheese (hello cholesterol bomb). 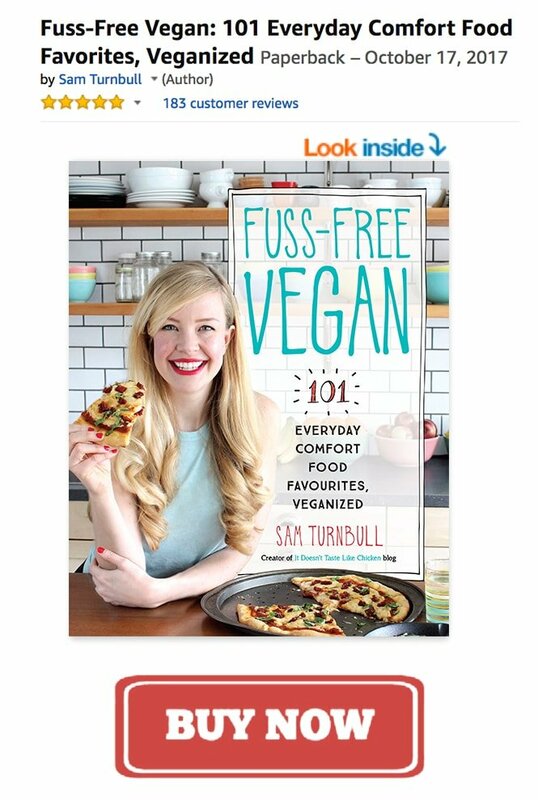 So it’s basically just about the least vegan dish there could be… which is why I had so much fun playing around in the kitchen and veganizing it! 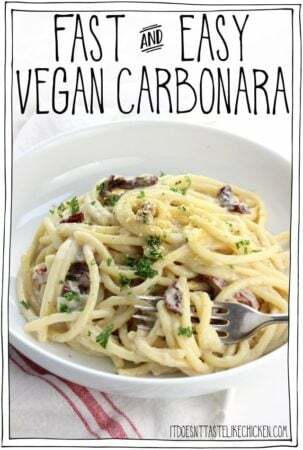 Not only did I figure out a way to get the creamy blissful sauce and the chewy delicious bites, but this turned out to be a super fast and easy vegan carbonara recipe. Just the way this girl likes it! For the bacon, I really wanted that salty, smoky, chewy bite. So I marinated some sun-dried tomatoes in soy sauce and liquid smoke. For the sauce, I wanted that creamy, slightly sticky, rich tasting sauce. So I sautéd up some onions and garlic and then made a super easy creamy sauce using non-dairy milk which I seasoned it with black salt to get that signature eggy flavour. Then I just boiled up some pasta (I opted for bucantini this time) and tossed it all together in a hot pan. The result? 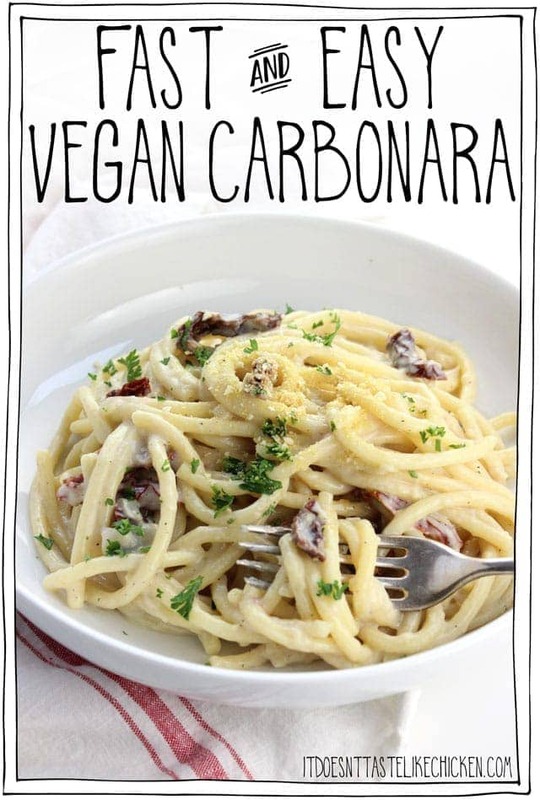 A 20 minute, easy vegan carbonara with the most glorious, creamy coated pasta noodles, and salty, smoky bites of scrumptiousness throughout. Perfect for a busy weeknight meal, made from ingredients you probably already have in the pantry. Oh my, oh my, I have found a new favourite. 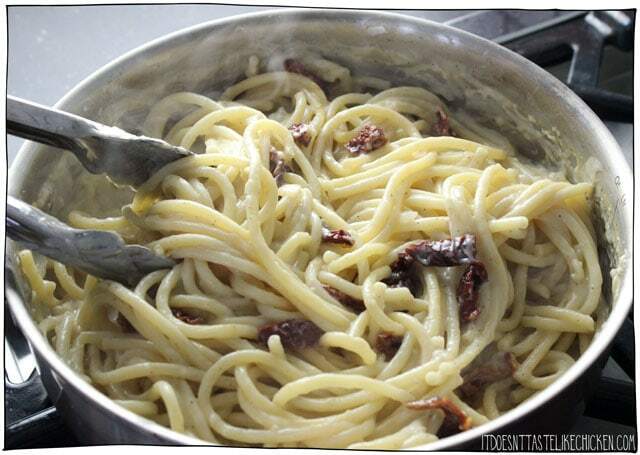 To make Fast and Easy Vegan Carbonara: mix together the sun-dried tomatoes, soy sauce, and liquid smoke in a small bowl and set aside to absorb the flavours while you prepare the rest of the dish. You want to make sure that you pick up the dry sun-dried tomatoes and not the kind in oil so they can absorb the flavours. If you only have the kind in oil on hand, then shake off the excess oil as much as possible. The sun-dried tomatoes will be super salty when you taste them as they are, but when you toss them with the creamy vegan carbonara, they chill out and add gorgeous salty pops of flavour throughout, just like bacon. Heat the olive oil in a large pan over medium-high heat. When hot add the onions and garlic and sauté until the onion turns translucent and begins to brown, about 5 minutes. Sprinkle over the flour and stir to coat the onions, let cook for about 60 seconds. Whisk in all of the remaining ingredients. Cook the sauce for about 5 minutes until thickened, whisking as needed. 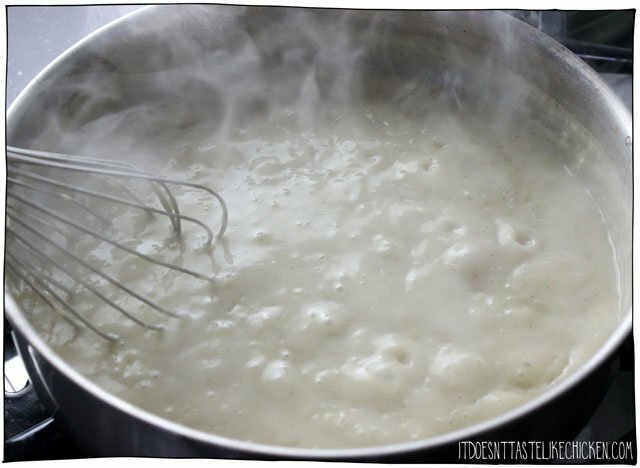 If the sauce gets too thick, add a splash more non-dairy milk, and if the sauce is too thin, simply cook it longer. Add the cooked pasta and the marinated sun-dried tomatoes to the sauce and toss well to combine. Serve hot. Garnish with parsley and parmegan if desired. This 20-minute pasta recipe is so easy to whip together. 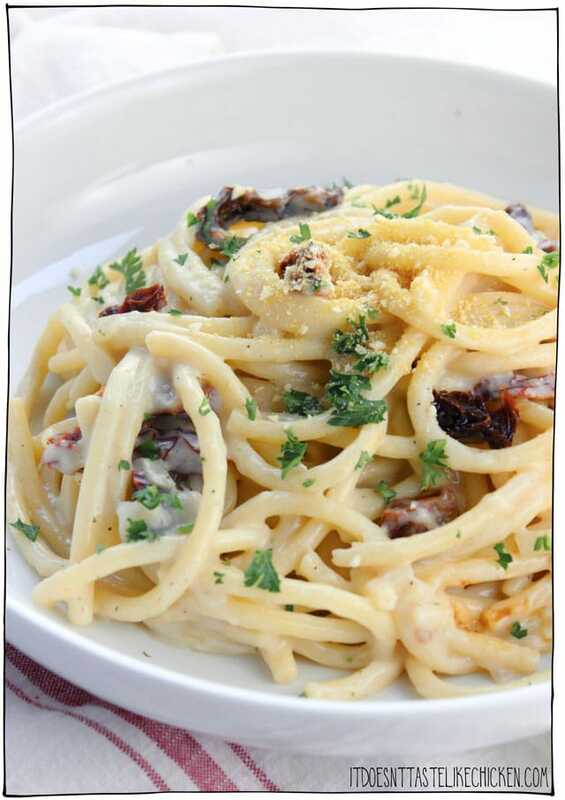 A simple creamy sauce coats the noodles with chewy, salty, smoky, bites of sun-dried tomato. Perfect for a busy weeknight meal, made from ingredients you probably already have in the pantry. Mix together the sun-dried tomatoes, soy sauce, and liquid smoke in a small bowl and set aside to absorb the flavours while you prepare the rest of the dish. Heat the olive oil in a large pan over medium-high heat. When hot add the onions and garlic and sauté until the onion turns translucent and begins to brown, about 5 minutes. 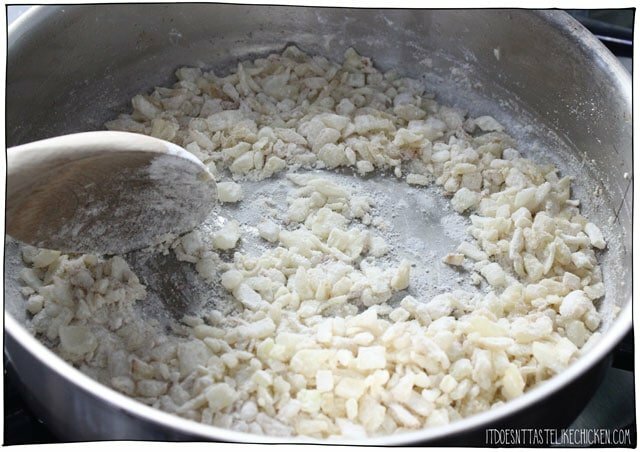 Sprinkle over the flour and stir to coat the onions, let cook for about 60 seconds, then whisk in all of the remaining ingredients. Cook the sauce for about 5 minutes until thickened, whisking as needed. 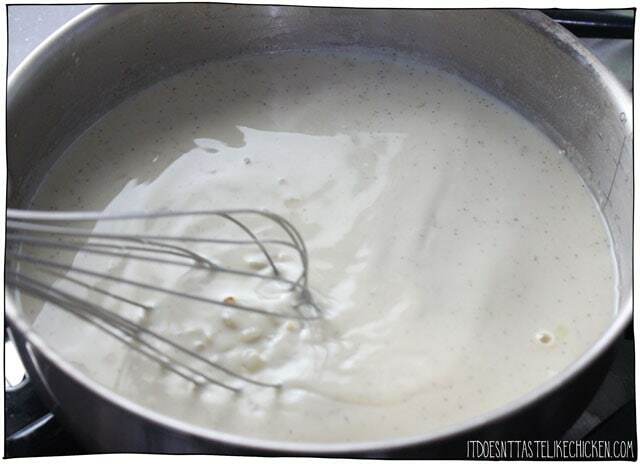 If the sauce gets too thick, add a splash more non-dairy milk, and if the sauce is too thin, simply cook it longer. This looks delish! What can I use in place of the nutritional yeast ~ I sadly have a family member who can’t tolerate it. There isn’t a great substitute for nutritional yeast so I would just skip it and up the other seasonings as needed. Enjoy! 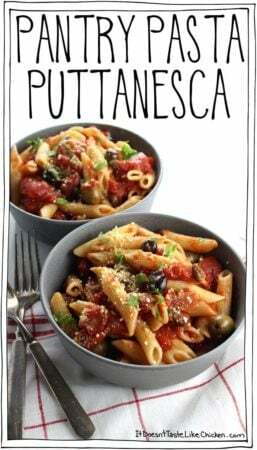 I’ve made this recipe several times and I have to say… This is my absolute favorite pasta dish! My 2 young kids devour it and my non-vegan husband really likes it too. 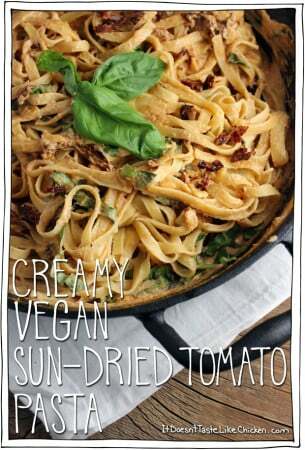 I usually double the sun dried tomatoes because we like a lot of that smokey salty goodness! Thanks for creating such wonderful, flavorful dishes. Your site is bookmarked and frequently visited. Keep up the amazing work girly! Made this tonight for a vegan potluck. HUGE hit! Definitely lives up to the name. 100% will make again. The only critique is that I didn’t double the recipe, since I only had a small portion at the potluck and within a blink of an eye it was all gone! Mmm! 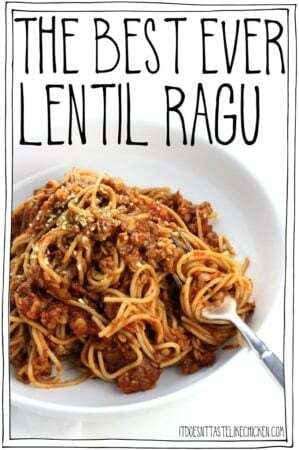 Usually when i try a new vegan recipe, i almost never end up liking it. This however is AMAZING! Made it just now. I didn’t have sun dried tomatoes so instead i sauteed some mushrooms in soy sauce and threw that in at the end and it was perfect. Only other thing i changed was i used almond milk. This tasted great. 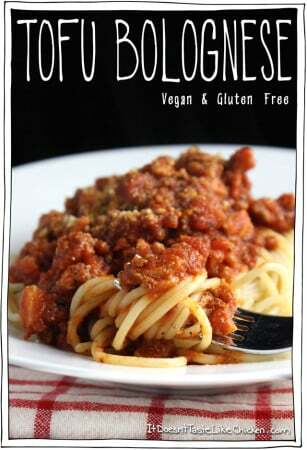 Two for two on your recipes as I’ve tried the vegan chili and loved it as well. Will be making more of your recipes very soon. Added an extra 1 tbsp of nutritional yeast. Used a mixture of oatly culinary cream and oat milk. Used corn flour to make it GF. It was so delicious! Can’t understand how anyone can say this is bland. It’s simple but really tasty. Haha, well I’m glad you enjoyed it! So happy you enjoyed it, Conrad! Made this recipe tonight, and we love it. I did add chili flakes and some additional kala namak, and I used coconut aminos in place of the soy sauce.. Fantastic recipe.. Thanks! Wonderful! Thrilled you enjoyed it so much ! Made this tonight. Agreed with some other comments that the sauce was a tiny bit bland, but I added in some hili flakes and extra nooch and loved it! I also ended up rinsing the tomato bits because I find liquid smoke so overwhelming… they were pretty salty but delicious in the pasta! I made the amount for two servings, but I ate almost all of it myself. So fantastic! This was fantastic! I didn’t have sundries tomatoes handy so, instead I used steamed broccoli and mushrooms. I also added crushed red pepper for some spice. I will definitely make this again. I really liked this! Easy, fast, and tasty. What more do you want? I am new to vegan cooking and this web site has been a great help. I’m looking forward to trying more of the recipes. 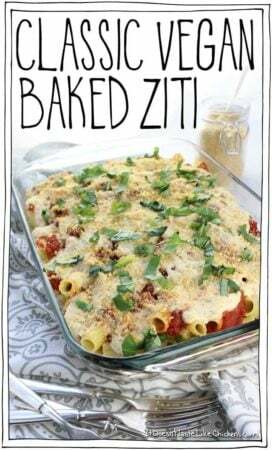 Delicious and easy to make! I loved that the sauce was really creamy and could be dressed up different ways. For example, I added mushrooms and frozen peas, but it would also be great with broccoli or oven roasted brussel sprouts. I didn’t have liquid smoke, but added a dash of cumin and cayenne to the soy sauce and it worked well. My husband and I really didn’t care for this. The sauce was bland & neither of us cared for the tomatoes. Plus the recipe wasn’t clear if the extra marinade should be added or not. I added it and honestly it was the only flavor the sauce had even with adding extra nooch. Sorry you didn’t enjoy it, Cher. Yes, yes, and yes! This was fabulous!!! I had some Rippl (vegan) half and half that I had leftover and it really made for a dreamy creamy sauce! My only error, and I’m not sure how it affected it, was adding “all the remaining ingredients” (including the tomatoes!) to the sauce. Then I read further down where they weren’t supposed to be added until the cooked noodles were. I think they nicely imparted the smoky flavor into the sauce, so it’s an “error” I’ll likely make again and again! This will stay in rotation for sure. So quick and easy. I served with steamed broccoli and cauliflower. Perfect dinner! It’s totally ok to add the tomatoes earlier, it just may tint your sauce a little brown. So happy you enjoyed it, Suzy! So delicious! Thank you for making my evening! Brilliant! 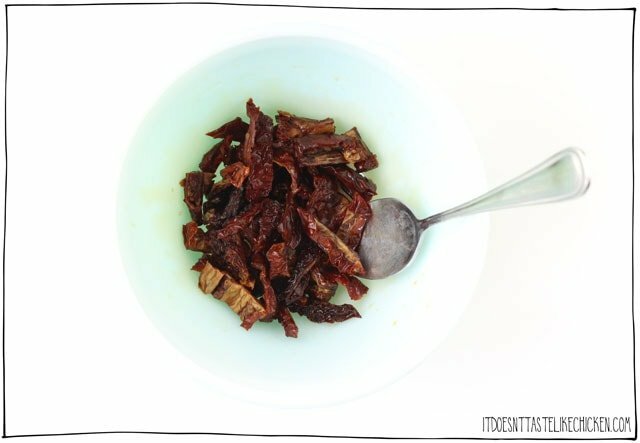 I absolutely love the smoky, salty sun dried tomatoes!! Wow! This was so easy and delicious! 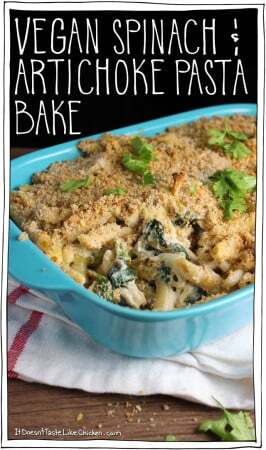 I also added more nutritional yeast – love that stuff! I had a beautiful bunch of broccoli so I added a handful of florets to the pasta for the last 3 minutes. Once again, no leftovers! I restrained myself, but spouse finished it off! Fortunately, he bikes long distances….. So. Friggin. Delish. I want this all the time. I made it with brown rice spaghetti and coconut milk so it came out super creamy and slightly sweet. The sun-dried tomatoes with liquid smoke and soy is brilliant. I want them on all the things! This worked great even with me running out of milk and adding pasta water. Also did frozen white onions because I hate cutting onions and the store was out of the frozen yellow. Kid wasn’t impressed only because she hates tomatoes unless it is ketchup. Will definitely make again. With ALL the dairy milk next time. Aww thanks for being a fan! This was so delicious. Quadrupled the amount of nooch though (can never have too much!). Picky hubby also loved it. Going on the favourites list!